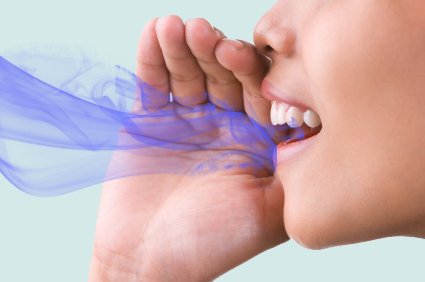 Halitosis, or bad breath, is a health condition affecting nearly 30 percent of people worldwide. Over 90 percent of the cases have a strong, foul oral odor originating in the mouth, around the tonsils and throat. Bad breath is a result of sulfur-producing bacteria that multiply under the tongue. These particular bacteria naturally occur in your mouth to aid digestions by breaking down proteins found in mucus, food, blood and diseased oral tissue into amino acids. Foods: Specific foods, such as garlic and onions, can worsen bad breath because they contain sulfur. Additionally, fish and meat contain dense proteins that are a source for bacteria. The acidity of juices and coffee contribute to halitosis and provide breeding grounds for bacteria. Dry mouth: A dry mouth is the ideal breeding ground for bacteria. In fact, the reason that people have dry mouth upon waking is because of the lack of saliva production during the sleep process. Illness and disease: Diabetes, kidney disease, liver disease, cancer and other disorders frequently cause chronic halitosis because they cause dry mouth. Pneumonia, post-nasal drip and bronchitis are also leading causes of bad breath. Certain medications, including high blood pressure medications, antidepressants and antihistamines, reduce the production of saliva in your mouth, resulting in extreme cases of halitosis. Poor dental hygiene: Bacteria can build up on the gums and teeth because of insufficient oral care. Without prompt and regular oral care regimens, periodontitis and gingivitis develop because the diseased tissue provides fuel to the odor-causing bacteria. Take dietary supplements. Take Vitamin B, C, D and E because they help eliminate excess toxins and mucus naturally. Proper oral care. Floss and brush teeth at least twice daily to remove plaque and food buildup. Brushing with baking soda. Bacteria in your mouth thrive in acidic environments. Cleaning with baking soda neutralizes excess acids in your mouth. Advance oral care products. Certain toothpastes and mouthwashes have been proven to fight bad breath effectively. Stimulating your salivary flow. Chewing gum, mints and lozenges can prevent dry mouth. Eating fibrous vegetables and fruits. Eating high-fiber fruits and vegetables help remove bacteria and moisten your mouth. Prevention is easier than cures and treatment. By establishing the following good habits, you can effectively prevent bad breath. Everyone has bad breath at some point. For some the cause is health-related, and for others it might just be what they ate for dinner. Keeping up with oral hygiene can usually treat the symptoms, but prevention is the best way to deal with halitosis. However, if you have a case of halitosis that will not go away, visit your dentist or doctor to determine if you need further tests to rule out a less common cause.